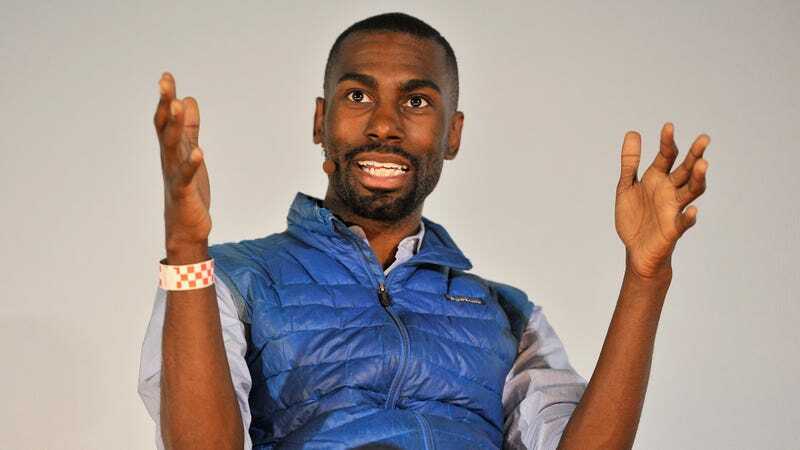 How Often Should DeRay Be Washing His Vest? I’ve been on the Blue Vest beat for years, tirelessly following the escapades of the former Baltimore mayoral candidate and activist DeRay McKesson. On Sunday at Vanity Fair’s Oscar party, McKesson’s post-meme Patagonia Blue Vest was spotted again. I don’t expect everyone to be a Blue Vest expert—I understand others cultivate more fruitful obsessions to fill the slow days of their lives. I started following McKesson in 2015 wanting to know not only his political movements after the Ferguson protests, but also his personal commitment to a single Blue Vest. Eventually, when McKesson declared he was going to run for mayor of Baltimore, I was met with more questions than answers: How many versions of the Blue Vest did he own? If there is only one, what is McKesson’s cleaning routine? Does he simply use a washer and dryer? Laundromat? Toothbrush, perhaps? All of these thoughts eventually led back to a simper question: How often does the Blue Vest get washed? Three years ago McKesson sent a simple tweet. One washing, one patch. Okay, okay. A late 2015 update I uncovered puts McKesson’s vest at one wash and two patch updates, in total. This particular visit saw the addition of an orange stripe that is clearly in reference to a traffic cone. I’ll be referring to this particular orange strip of fabric as Caution. In April 2016, the Baltimore Sun reported that McKesson had washed Blue Vest only two times since his rise to fame. That puts my count at two washes, two patches. This July 2017 tweet now puts my reporting of Blue Vest at two washes and three patches. McKesson even joked about Blue Vest needing a wash. How must Blue Vest & Caution feel, knowing their owner would rather put them in hands of strangers with needles, than give them a loving cleaning? A December 2017 tweet confirms that Blue Vest & Caution got a new zipper, no wash.
Wash your gear only when it’s absolutely necessary, you’ll conserve water, minimize wear and tear on your garments in the process). Even your most-used outerwear should only need a full wash occasionally. If it’s caked with dirt (and we hope it will be), consider using a rag or sponge to spot clean rather than putting it through a machine cycle. Patagonia, an outdoorsy brand that’s incredibly woke to the suffering of planet Earth, is pro-dirt. Even layers of dirt. It’s disheartening to know that Blue Vest & Caution are certainly more familiar with the sound of industrial sewing machines than clean running water, but maybe they like it that way. My thoughts and prayers remain with them as they seemingly await another year till bathing. Jezebel has reached out to McKesson for comment and will update if we hear back. We will also update the next time he publicly engages in any kind of vest care.